Plan your visit to this world-famous, three-story, stained-glass globe — one of the key attractions at the Library. The Library is also showing a complementary exhibit, “The Mapparium: An Inside View,” featuring never before made public letters, documents, and artifacts showcasing the construction, history, and significance of this magnificent architectural and artistic achievement. Learn more about the history of the Mapparium and its architect, Chester Lindsay Churchill. Explore how the 1935 world map inside the Mapparium, which has never been updated, serves as a remarkable snapshot of both geographic and global history. Discover major changes in the world since 1935 such as Africa’s movement from colonial rule to independence and learn more about how global change happens. The Mapparium® is available for view by tour only. 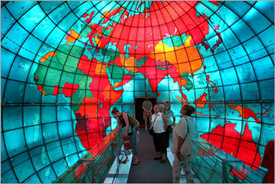 Tours of the Mapparium run every 20 minutes, lasting 15-20 minutes. The first tour of the day starts at 10:20 a.m., and the last tour starts at 4:00 p.m.
Limited $10 parking is available to visitors of the Library with ticket validation. Please validate your parking ticket at reception when you exit the Library. Entrance to the underground lot is near the intersection of Huntington and Massachusetts Avenues, next to Horticultural Hall. Paid public parking garages are also available in the Prudential Center and on Westland Avenue (near Symphony Hall), and there is limited street parking in the area.